Teaching a three day workshop in the middle of January is a great time to focus on dissecting, studying, and drawing a flowering potted plant. 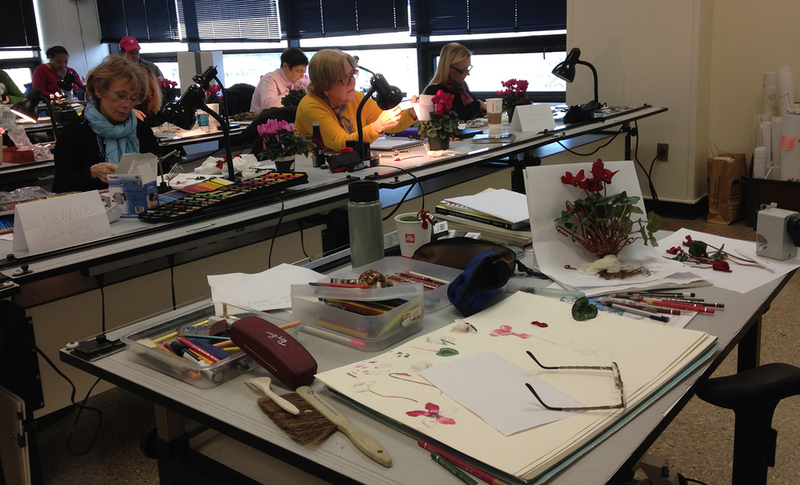 Here is how I approached this recent workshop at the New York Botanical Garden where we had Cyclamen plants as our model. Day 1: What to draw first? We started by reading a detailed description of the plant and the characteristics that make this plant unique. In the case of the Cyclamen it has a tuber from which individual flowers, leaves, and roots grow. The leaves and flowers sprout from growing points on top of the tuber. The roots can grow from many places on the tuber depending on the species. The flowers are unusual. The stem of the flower is bent so that the nose of the flower faces downward. Once we understood what makes this plant unique we were able to start drawing all the components. We had plants with lots of flowers so we were easily able to take apart many flowers to use and study up close. Day 2: After understanding and drawing plant structure there is more time to focus on the color of the flowers and the patterning on the leaves. Day 3: Study the complete plant by taking it out of the pot and washing the soil away to reveal the tuber and the roots. We were able to plan and start a complete drawing of the whole plant. One student focused on a magnification of a dissected flower. Students were able to take their plants home and continue working to finish after the workshop was finished. Three days goes by very quickly! Students from this class: Please upload your sketch pages and or completed drawings here for everyone to see!